If you like a combination of mountains, lakes and desert golf with excellent wines, the Okanagan is your golf vacation destination. 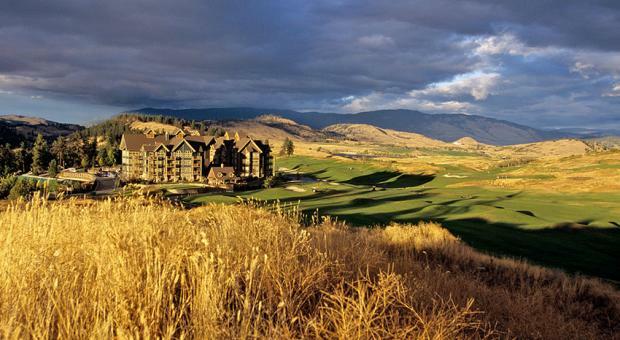 Consistently rated among Canada's best golf courses by Score Golf Magazine, both Predator Ridge Resort and Gallagher's Canyon Golf Club are just 2 of the many championship courses that dot this region. In addition, new courses like the Rise Golf Club in Vernon and Tower Ranch in Kelowna are only adding to selection of top courses you can play while on a tour of the Okanagan. After your round of golf, take a scenic drive or shuttle to one of the many wineries in the area and sample some of B.C's best wines. Choose from golf resorts, downtown hotels, or luxury lakeside villas and create your next one of a kind Okanagan golf vacation. One of Kelowna’s first luxury lakeside resorts, Mission Shores delivers a level of design and sophistication not previously seen in the Okanagan. Situated directly across from Kelowna’s famous Hot Sands Beach, the Prestige Inn Kelowna is conveniently located downtown, close to tourist attractions, business, shopping and recreational areas. Located near the sunny shores of Osoyoos Lake and steps from Okanagan golf courses and vineyards, Spirit Ridge Resort has set a new standard for premium resort accommodations.